More than three-quarters of all proteins are phosphorylated at one or more sites in human cells. A ‘tug of war’ between kinases and phosphatases establishes the phosphorylation states of proteins to control their function. To understand how protein phosphorylation regulates complex biological processes, we must investigate both forward and reverse reactions, connecting kinases and phosphatases on their shared substrates. Although there has been great progress in deciphering signaling by kinases, much less is known about phosphatases. Research in my laboratory focuses on uncovering previously unrecognized roles of phosphatases in cellular signaling networks in normal tissues and in cancer. We establish specific phosphatase-substrate relationships, identify opposing kinases, and determine regulatory inputs. While previous studies have mainly concentrated on one enzyme at a time [3-5], my research program looks at cellular networks as a whole. My laboratory is uniquely positioned for this work because we combine systematic quantitative measurements of the proteome and phosphoproteome with reconstitution of minimal signaling units in vitro, so as to specify phosphatase behavior precisely. MCB – BIOC 101: Molecular information in biological systems. 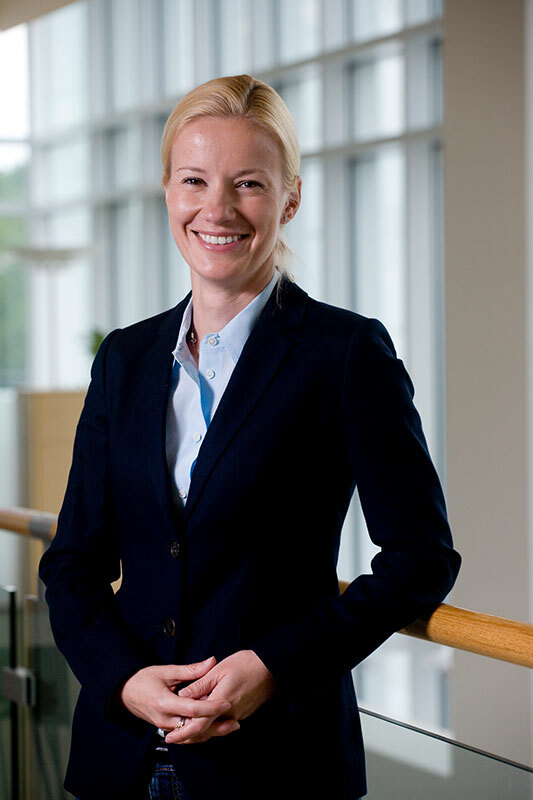 Dr. Arminja Kettenbach is currently an Assistant Professor of Biochemistry and Cell Biology at the Geisel School of Medicine at Dartmouth College. Arminja earned her Master degree (Diplom) in Biochemistry at the Eberhard-Karls University in Tuebingen, Germany, in 2002. For her PhD, she joined the laboratory of Dr. Frank McKeon in the Department of Cell Biology at Harvard Medical School, Boston, in 2003. Her thesis work focused on mechanisms of cell division and cell differentiation. It was there that Arminja was exposed first to mass spectrometry-based proteomics and decided to further explore this field for her post-doctoral studies. In 2007, she joined the laboratory of Dr. Scott Gerber in the Department of Genetics at the Geisel School of Medicine at Dartmouth College where she pioneered quantitative phosphoproteomics approaches to study cell signaling. As an independent investigator, Dr. Kettenbach is focused on understanding signaling by phosphoprotein phosphatases and their cellular networks in triple-negative breast cancer (TNBC) by combining technology development, studies of cell culture models and human primary tumors.